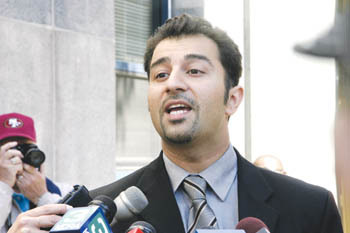 Media Blitzed: Attorney Saad Ahmad says media reports about his client Shabbir Ahmedlike an article that claimed he had encouraged violence against U.S. troopshave been blatantly false. WHEN ASR, or the late-afternoon prayer, ends at Lodi's Muslim Mosque, the worshippers gradually begin to settle into a reassuring routine. It's been three weeks since the arrests of Umer and Hamid Hayat, the father and son who are charged with lying to the FBI and accused of having terrorist linksthree weeks since rows of regional and national media parked themselves right in front of the mosque, making any attempts at normalcy futile. Unlike most mosques in the Bay Area, which typically see a handful of worshippers for the five daily prayers and jam-packed prayer halls for the obligatory Friday prayer, Lodi boasts a Muslim community that revolves around the mosque seven days a week. Indeed, after the late-afternoon prayer, which is recited at 6:30pm these days, much of the community sticks around the mosque to wait for the sunset prayer. They create a scene where Pakistani shalwaar-kameezes and long, scraggily beards mix easily with baggy jeans, T-shirts and baseball caps with flat brims. Everyday after the prayer, a curtain is drawn inside of the mosque, partitioning off about half the space. In that space, long, low, skinny tables are set up in a large rectangle. There, young boysmost of them no older than 12 or 13, some of them much youngersit and learn to recite the Koran, their high, wavering voices combining to produce an ebb and flow of sound that's been made notorious by the Western media after it repeatedly broadcast clips of South Asian madrassahs immediately following 9/11despite the fact that none of the 9/11-hijackers came from South Asian madrassahs. Meanwhile, other boysmost of them teenagers, this timewander off to the basketball court directly across the street from the mosque, happy, perhaps, that they've outgrown the mandatory Koran lessons; there, they shoot hoop until it becomes too dark to see the ball. They are a close-knit group, oblivious or unconcerned, it seems, that the mosque is only a stone's throw away or that Muhammed Shoaib, the mosque's president, often relaxes on the grass 10 paces from the court as they shout out profanity-laced playground taunts at each other. In the same park, a group of about 40 men set up their daily volleyball game, only it's a version of volleyball that's played with men crammed almost shoulder-to-shoulder on both sides of the net, where volleys are directed only back across the net and never to a teammate, and which is played with a soccer ball instead of a volleyball. Women, meanwhile, are nowhere to be seen. As a handful of men are lounging on the grass of the park across the street from the mosque, they're approached by a tall Caucasian man in khakis and a tucked-in shirt. He smiles tentatively. "Hi, I'm with the Sentinel," he begins. He's a reporter. From the Lodi News-Sentinel, the local Lodi daily. Jake Armstrong is his name. He's looking for Muslims who have been questioned by the FBI. A lanky Muslim dressed in a blue shalwaar-kameez decides to appoint himself the group's spokesman, and brusquely demands to see the reporter's identification. "Before, we used to talk to the Christians and Jews," he proudly explains in a thick accent. "My neighbor, he is Christian. I talk to him all the time. But now we must be careful, and you must show us your ID if you want to talk." Armstrong is flustered, not expecting this reception. Worse yet, he doesn't have his ID on him. He backs off and makes a quick phone call. A few short moments later, Armstrong is joined by a young Pakistani teenager. The teenager knows the men, and it turns out that Armstrong (or his newspaper) is paying him a fee to plug him into Lodi's Muslim community. The teenager begins speaking to the man in the blue shalwaar in an excited mishmash of Pashtu and English: "Would I ever do anything to hurt you guys?" he asks the man at one point as he pleads that he talk to Armstrong without the benefit of the reporter's ID. Five minutes later, the man in the blue shalwaar is convinced, and he begins talking in rapid-fire, broken English. He ignores the question about referrals to those questioned by the FBI and proceeds to give an overwhelmed Armstrong an earful of how badly the media have covered the Lodi terrorism probe. "I better still get paid," grins the teenager. The media storm that followed the Lodi arrests and detentions has been, up until now, not unlike those which have followed other terrorism-related arrests since 9/11. The pattern has been agonizingly consistent: A flurry of media coverage immediately following the arrests, most of it not skeptical of the government's allegations, which peters out as the government's cases fizzle. The arrests are front-page news, while the releases are buried in the back of the newspaper. When, for instance, Senior Airman Ahmad al-Halabi, an Air Force translator who worked in Guantanamo Bay, was charged with spying for Syria two Septembers ago, The New York Times gave his case the front page and more than 1,000 words; three months later, when three counts against al-Halabi were droppedcounts that his attorney described as the "gut of the case"the same newspaper reported the news on page 40 in 147 words. (A year later, the Times did publish a feature-length story that dissected the flawed cases against al-Halabi and other Muslim servicemen at Guantanamo.) Mohammed Hossain and Yassin Aref, two leaders of a mosque in Albany, N.Y., are all but forgotten now, after their case made headlines upon their arrest in 2004 for allegedly devising a plot to import a shoulder-fired missile and using it to assassinate a Pakistani diplomat in New York City. The case against them has also been weakened. Case in point for Lodi: Of the more than 60 stories that have been written by the four major California dailiesthe Los Angeles Times, Sacramento Bee, San Jose Mercury News and San Francisco Chroniclecovering the recent arrests, only a tiny fraction, including a Los Angeles Times piece published June 9, saw fit to point out that the federal government's track record on terrorism convictions is, in the words of the Times, "not unblemished." Even then, the story failed to mention that former Attorney General John Ashcroft was unable to secure a single terrorism-related conviction despite rounding up 5,000 foreign nationals from Muslim communities after 9/11. "There have been some good articles [about the Lodi case]," acknowledges Hatem Bazian, an adjunct professor at Berkeley who has been studying the federal government's focus on Muslims and Arabs after 9/11 and is working on a forthcoming book, Virtual Internment, on the subject. "But what's a few articles against the damage of an avalanche? You're trying to stop an avalanche with a few flakes of snow. The press runs without any critique. Rather than examining the veracity of the government's claims, it essentially takes the government's claims and runs with them as if they are valid. It is as if the media is yet another agency further trying to see and expose the 'terrorists' among us." In a weblog posting soon after the Lodi detentions, Bazian analyzed the photographs chosen for a front-page Chronicle story about the probe. One was a shot of Muhammed Adil Khan, the Lodi religious leader detained on an immigration violations charge; the second shot was of Fazlur Rehman Khalil, who allegedly ran a terrorist training camp in Pakistan and who the government claims was an "associate" of Khan's father in Pakistan; and the third shot was one of Osama bin Laden, with a caption saying that Khalil signed a bin Laden fatwa in 1998 that advocated the killing of Americans and their allies. Bazian shakes his head in disgust at the Chronicle. "The press doesn't question whether this is a legitimate link that needs to be made to begin with," he says. "Essentially, you're condemning them [the Lodi religious leaders]. When you place those pictures in that context, you are pretty much determining that those persons are guilty, regardless of what you write later." Indeed, a June 25 Los Angeles Times headline about the San Francisco immigration hearing of Shabbir Ahmed, the former imam of Lodi's mosque, reads: "Muslim Cleric Says He Spoke Against U.S.: At a hearing on immigration charges, Lodi mosque leader testifies he exhorted Pakistanis to fight U.S. troops in Afghanistan." Meanwhile, in the body of the story, not a single quote by Ahmed from the hearing is offered that justifies the headline. The closest the Times gets to Ahmed "testifying" that he urged Pakistanis to fight U.S. troops is quoting the imam responding to a question asking him if he urged people to "defend" Osama bin Laden; the imam replied (in Urdu and through a translator), "Being emotional, I may have said it, or I may not have said it." When questioned by a reporter from Metro about the Times headline, Ahmed's attorney, Fremont-based Saad Ahmad (no relation to Ahmed), violently shook his head. "Absolutely not," he said. "My client never encouraged violence [against U.S. troops]." But even Saad Ahmad has taken a tentative approach to his client's opposition to the U.S. bombing of Afghanistan when he was in Pakistan, pointing out that his client has changed his opinions about the United States once he got to the country and that he now supports the war on terror. Bazian, meanwhile, questions why the press believes it's relevant, as the government does, that Ahmed made inflammatory statements about the United States during the bombing of Afghanistan. "Everybody in America that rails and screams about Islam and America would be subject to arrest if they travel to the Muslim world, based on that criteria," says Bazian. "You might disagree with Ahmed's statements, you might condemn his statements, but you can't say he doesn't have the right to say those statements." From the July 6-12, 2005 issue of Metro, Silicon Valley's Weekly Newspaper.